This string quartet specialized in cross-over repertoire takes its name from the place where classical, pop and jazz music meet: the inner courtyards with luxuriant vegetation of the Grand Hotel dating back to the “Belle Epoque” era. Its repertoire ranges from the famous original and transcribed classical music, to opera arias, from the musical to the heights of jazz and pop music. 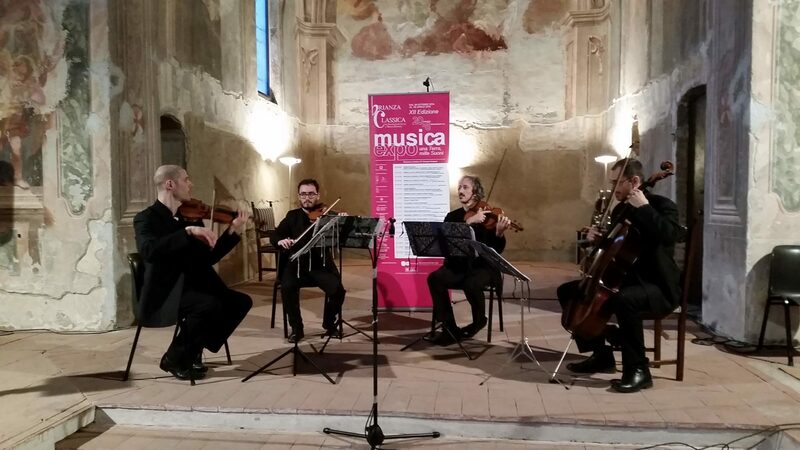 Originally born as flute and string trio quartet, in October 2003 the quartet inaugurated an important chamber season at the prestigious Teatro Olimpico in Vicenza (“Encounters on the keyboard”) with great success by critics. Then The Palm Court Quartet has performed for several national seasons in Italy and abroad (Spain, Montecarlo…) such as: “Concerti e Colline”, “Corona Ferrea” of Monza, Brianza Classica Festival, Classical Turin, International Chamber Music Festival in Val d’Aosta, Ultrpadaduum Festival “Villa Oliva “Cassano Magnago, Terre d’Arezzo Music Festival and others, receiving everywhere enthusiastic feedbacks from public authorities and organizers. The Palm Court Quartet proposes “From the Gramophone to the Big Screen”, a fascinating concert with video projections that plunges the audience into the fantastic world of silent cinema.